The recent tendency in our technology world is to move from using your personal computer for storage and processing of data to cloud-based storage and processing. There are very few people now who have never heard about cloud-based file storage facilities, email, office packages and so on. Even ERP systems are now moving to cloud, for example SAP actively promotes HANA-based cloud solutions. There are some distributions that use the cloud paradigm and offer the user cloud-based solutions in a single package. One of these distributions is Peppermint OS. I wrote about Peppermint Three almost five years ago, in September 2012. 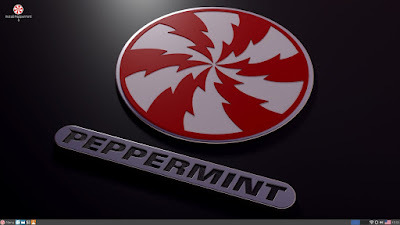 Since then, Peppermint has seen several releases, and the most current version now is Peppermint Eight, based on Ubuntu 16.04. 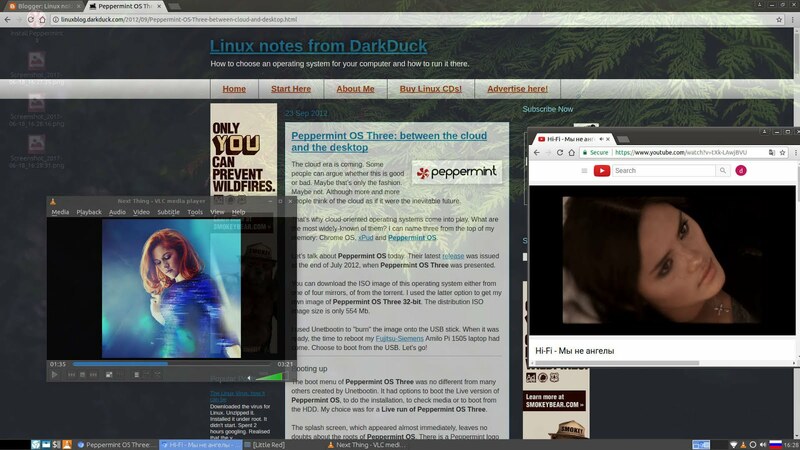 You can download Peppermint from one of the several mirrors, or using a torrent. The ISO image of Peppermint Eight 64-bit is about 1.3 GB in size. Once downloaded, I "burnt" the ISO image onto my USB stick. This USB stick is in the port of my Dell Inspirion 17 laptop. Reboot. Choose to boot from USB. Fasten your seatbelts! Let's go to the cloud! Once the boot process starts, you can hear a very loud BEEP, similar to the one from the Linux virus. And then a menu appears on the screen, on which you have a choice: try a Live version of Peppermint, Install it, check media, boot from HDD, check memory and so on. My choice was for the Live run of Peppermint Eight, and I selected that default option. The operating system did not ask me any more questions, but instead rather quickly landed me onto the default desktop. 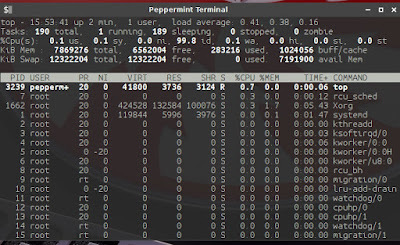 Peppermint Eight gives you a very colourful example of an Ubuntu-based Xfce distribution. I mean there were a lot of colours: on the default wallpaper, in the menu, on the panel. Not boring at all, not too motley. If you don't like this wallpaper, you have a choice of about 20-30 alternative images. There is a panel at the bottom of the screen. The left part of the panel is taken by the menu button that once again features the Peppermint logo and a choice of quick shortcut buttons: Chromium browser, File manager, Terminal and VLC player. The menu button also works with the Super (Windows) key, which is a nice bonus even in modern distributions. For example, my Kubuntu 16.04 installation does not have this option. The right part of the panel contains a switch between two virtual desktops and a notification area where you find volume, network and battery indicators, keyboard layouts language flag and clocks. As you can see, this is more or less standard Xfce-based setup, nothing too exciting, nothing important missing. The freshly booted operating system took a mere 283 Mb of memory, which is very decent nowadays. Inactive windows in Peppermint Eight are configured to get some opacity. It means that you will see your desktop image a bit more often than usually: it will be visible through the inactive window contents when your active window does not cover the full screen. If we are going to use the cloud, we have a requirement to have Network up and running as a prerequisite. Peppermint Eight is based on Ubuntu 16.04, and this operating system correctly works with the wireless card of my laptop. I only had to click the network indicator icon on the panel, select the network from the list and type in the password. Peppermint Eight starts with English US as a default keyboard layout. If you don't like that layout, or you want to add another one, you can right-click the flag indicator in the notification area of the panel, select the Keyboard Settings in the menu, and then configure your layouts on the relevant tab of the window. This is the standard procedure for Xfce-based distributions, and the Peppermint team eases the procedure for you as they have added the indicator to the panel by default. Peppermint Eight comes with VLC as default music and video player. It means you have zero troubles with playing almost any audio or video file. Chromium browser is also well-equipped to show video files from 1tv.ru, Vimeo and, of course, YouTube sites. Peppermint Eight is aimed to be a cloud-centric distribution. That impacted the set of applications you get out of the box. Chromium is the default and the only browser available immediately. There is also a torrent client and a Dropbox in the Internet menu. 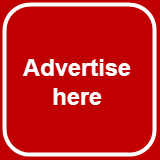 Apart from those, there are a couple of links to Peppermint Help and Forum sites, and a very interesting application called ICE SSB Manager. SSB stands for Single-Site Browser. It allows you to create an "application" from any URL, and place it in the menu. Generally speaking, Chrome and Chromium applications have similar features from the very beginning of the project. In the most recent versions this is the "Add to Desktop" item in the More Tools part of the menu. But ICE allows you to do the same trick with other supported browsers: Firefox and Vivaldi. To be honest, I only tried it with Chromium, and it worked for me. I leave it for you to test other browsers if you wish. As you can imagine, there are many similar "applications" already in the Peppermint menu. The Graphics section of the Peppermint Eight menu contains Editor and Express versions of Pixlr, Document viewer and the Simple Scan utility. Image Viewer is also available in this operating system, but it is listed elsewhere in the menu. The Office applications only have links to Google Drive, Google Calendar and GMail, and the same local Document Viewer. Of course, you need a Google account to use these cloud-based applications, or alternatively you can create your own "applications" from other providers, for example Microsoft cloud-based office tools or OneDrive. The Sound & Video section of the menu sports VLC player, guvcview web-camera manager and PulseAudio controls. There are also separate sections for Accessories and System Tools where you can find the usual suspects, this time not cloud-based: partition manager GParted, Samba configuration, Calculator, Image Viewer, screenshot utility, xed simple text editor and so on. Synaptic application manager and separate Software Manager (mintInstall) are also included in the System Tools menu, which allows you to install applications from the vast Ubuntu repositories and PPAs in just few clicks and keyboard strokes. The only "but" that I would like to mention here is that Peppermint is too strongly Google-oriented. There are some other cloud-based Office and Email solutions. Adding links to them in the default operating system would not require too many resources, but would at least pretend giving the user some choices. The main thing I have always liked about Peppermint is that it just works. Been using it for years, 3, 5, 6 and now 7 and I may try 8 but 7 is fine. 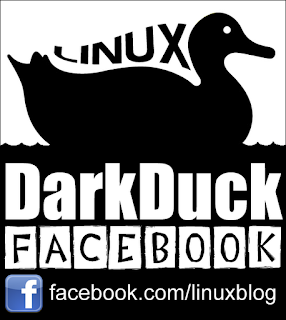 I found it to be the easiest to use of any of the distros I have tried and four years ago when I was new to Linux, it made the transition very easy. The main thing about Peppermint is that it installs a very lean system that you can then build upon and upgrade. Even though it is Ubuntu based, I always found it easier to use than Ubuntu, Lubuntu, Kubuntu and all the rest. Rock solid, never had one computer crash with it. Whatever it is that they do different from other Ubuntu flavors, I don't know but they do it right! Thanks for your input! Great that you like this OS. It is okay but a bit weird. I remember the Pepermint 1 and was okay. Nowadays I tested this release and seems a bit odd. For daily use it is strange. All those cloud based things aren't for a daily basis.... okay for a usb sticker to take on a trip and put it to work on a 11"/12" inch laptop/tablet but for a desktop or a laptop at home no way. Every distro has its own targets, Fredinato. And every user has its own usage pattern. To be honest, I haven't used Pepperming much myself, so I cannot comment much. What I would say for sure, I prefer desktop editions of software to cloud-based ones.